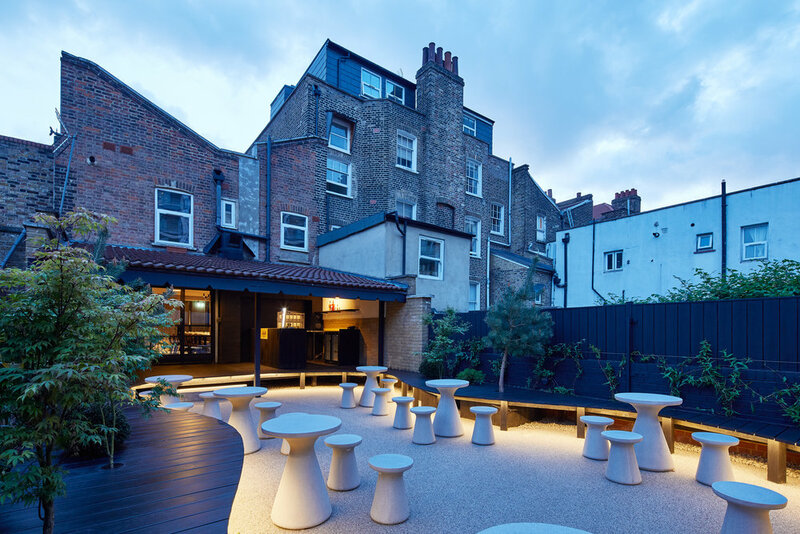 The Moon Garden, at Untitled Bar in London, is a playful contemporary space evoking the gravel gardens of Japan in East London. It is designed as a single pool of light, reflecting white during the day, and lit by a glowing artificial moon at night. 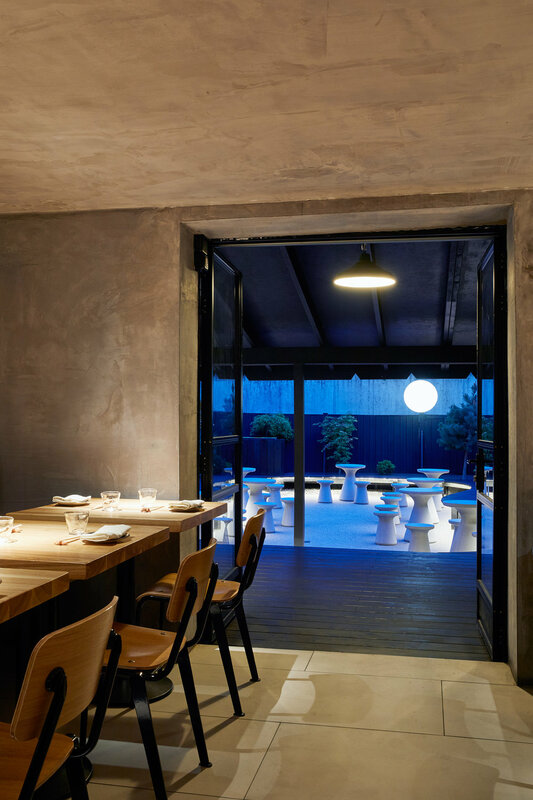 The covered platform that connects to the rear of the restaurant provides a dark intimate bar counter and directs the view downwards into the garden. 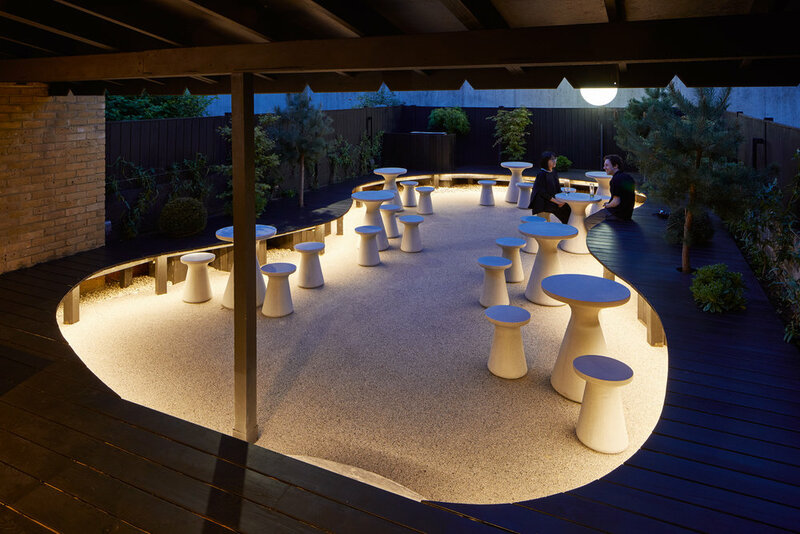 Black stained decking provides a continuous, planted seating surface that encloses the space, tucking under the canopy to provide a sheltered ‘engawa’ edge for contemplating the moon. The glowing space is visible throughout the length of the restaurant and bar and all the way to the street, drawing in visitors from Kingsland Road. The Moon Garden is a 20-cover area accessible to the rear of Untitled, giving guests the chance to enjoy al fresco dining and drinking during the summer months. As a partnership with Japanese beer brand Asahi Super Dry, the garden offers a dedicated bar serving the premium Japanese beer on tap, as well as an extended sake list and garden cocktail menu. An open yakitori charcoal grill will add an element of theatre to proceedings. Wallpaper*: "Moon Garden designed by SoHo+Co opens at Untitled Bar"